Looking for Church gifts for Mothering Sunday? 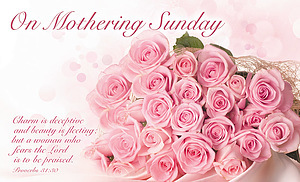 A pack of 24 Mothering Sunday post cards to give out as a gift to the mothers of your church. Postcards are blank on the reverse for you to write your own message of encouragement. On Mothering Sunday Postcards - Pack of 24 is published by Teal Press and is our 289th best seller. The ISBN for On Mothering Sunday Postcards - Pack of 24 is 5060069272645. Be the first to review On Mothering Sunday Postcards - Pack of 24! Got a question? No problem! Just click here to ask us about On Mothering Sunday Postcards - Pack of 24.